It’s been hailed as the single most important issue inhibiting growth in Australian golf. And it’s all about making women and girls more welcome at golf courses around this country…no, make that the world. 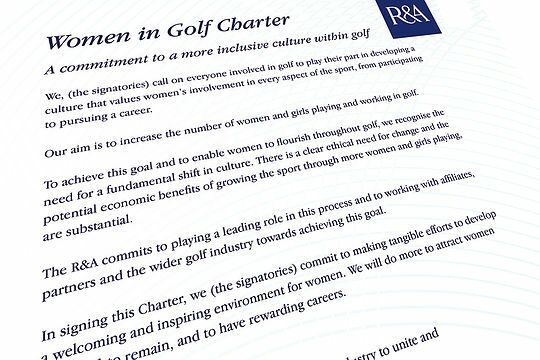 The Royal and Ancient have jumped on board too and last week unveiled its Women In Golf Charter to try and increase the number of women and girls taking part in golf and encourage more opportunities for women to work in the industry as well. Golf Australia’s new national female participation manager Chyloe Kurdas was among those in London to launch an initiative aimed at inspiring an industry-wide commitment to develop a more inclusive culture in golf worldwide. According to Golf Australia chief executive Stephen Pitt for too long we have watched as some of our programs, clubs and facilities became places at which female golfers, particularly prospective ones, didn’t feel welcome and encouraged. “Vision 2025 is, critically, an industry-wide approach and we are investing all available resources into making it a success,” said Pitt. Develop an inclusive environment for women and girls within golf. Golf Australia: Is golf on the way back?